The Tata Motors stand at this month's 79th Geneva Motor Show played host to the world première of the Tata Pr1ma (above) a styling model designed and built by Pininfarina which is the first official project of the new Tata-Pininfarina cooperation. The Tata Motors Limited stand at this month's Geneva Motor Show played host to the world première of the Tata Pr1ma (Italian for “First”), a styling model designed and built by Pininfarina for the Indian company, first official project - hence its name - of the Tata-Pininfarina cooperation in the fields of research, design and engineering. As part of a strategy outlined early in 2008, Pininfarina has set itself the goal of establishing itself in India where it offers its design and engineering services to local carmakers. Based on the platform of the first Indian saloon, the Tata Indigo, the Tata Pr1ma designed by Pininfarina offers an indication of how the next generation of Tata saloons could be interpreted, with a distinctive, elegant design. Conceived to provide luxurious comfort, this 4-door model has a sober but very refined design, combined with sinuous lines that give the car the personality of a coupe. 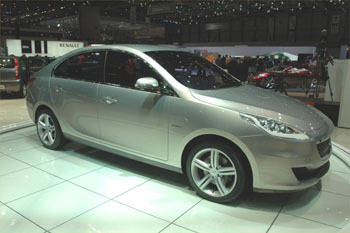 It is a solution that immediately adds value, compared to the essential design usually associated with the Tata brand. The Tata Pr1ma addresses a higher segment, and the external and internal measurements are larger than those of the Indigo, thanks to a longer wheelbase (2700 mm). The design balances fluidity and tension, which is visible in the lines that run from the front to the rear of the car. The result is an elegant look, and proportions that are both classic and modern. The model’s sleek silhouette conveys dynamism and a strong temperament. The long wheelbase creates a generous amount of room inside, underlined by the uninterrupted profile of the doors, a clean, strong blend of the best ideas of Pininfarina design. Without limiting the space inside, the tapered rear end and inclined passenger compartment convey the feeling of a coupe, underlined by the refined treatment of the pillar, an element that is typical of Pininfarina styling and sportiness. The front view and the shape of the rear light clusters merge into the distinctive lines of the car’s design, underlining its presence and dimensions. The roof stretches towards the front, conveying a sense of power and force. Each detail has been studied with care, not to decorate, but to underline the basic theme of the design and to raise the profile of the Tata logo.